I can lay on dirt, climb through brush, filter water from a creek, eat with my fingers and sleep with the bugs. Showers are optional and pit toilets are a luxury. All of this I can endure in the backwoods, but I can't skip my coffee. I've experimented with many the different ways of methods and types of coffee on the mountain, the woods and the desert. Below I rank my top methods based on trade-offs between cost, weight, and taste. You can purchase these packets in grocery stores. Just heat your water, add the packet(s) of instant, stir, and you're done. It is the quickest, lightest, and easiest cleanup, though you will have to packout the trash. The flavor isn't bad, but isn't great flavor either compared to the other option. 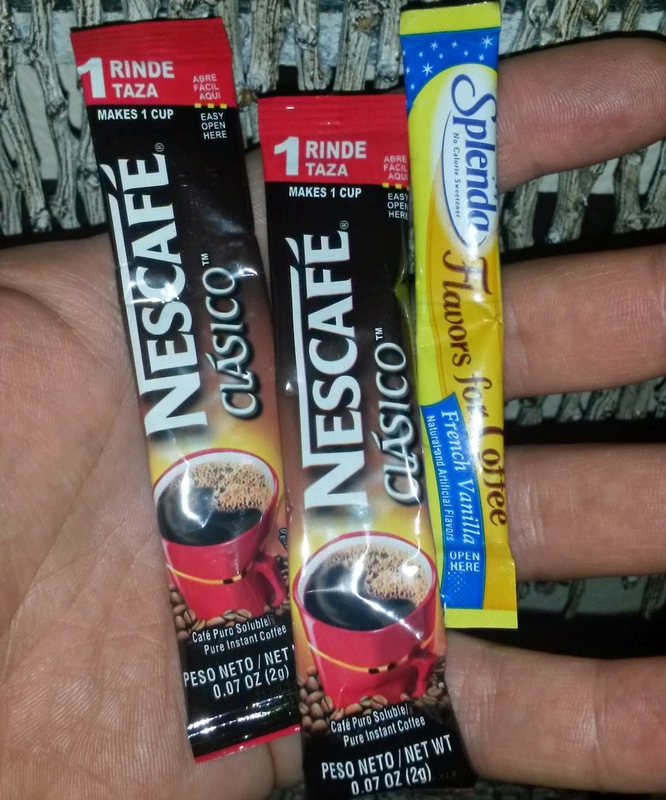 I prefer stronger coffee with a bold taste, so 2 packets of Necafe's Spanish coffee has been my favorite. I supposed you could also bag instant coffee, which would be less trash, but I don't drink instant coffee so I prefer the small packets. This option is best for a quick, mess-free cup on a thru-hike backpacking trip where you don't have time to sit and enjoy a best breakfast. I know, corny title, but I couldn't help it. You can find this common percolator in any camping or retail store. Percolators work by placing over heat with grounds in top filter and water in the bottom of the pot. The water is boiled, which pushes it up a metal tube then spits it out at the top. The water hits the cap, lands on the grounds and soaks back through into the water supply to circulate again. By the end of the brew, your boiling water will turn into coffee and run through the grounds multiple times. While this leads to a nice, strong flavor, coffee is best brewed slightly below boiling to prevent the burned flavor most people are used to. 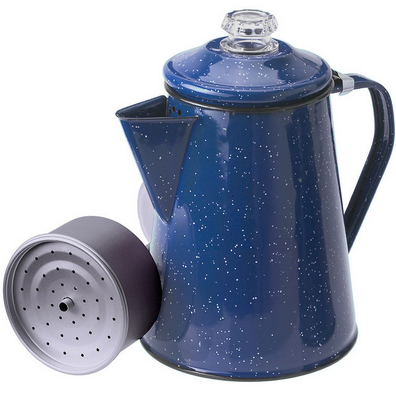 The percolator is also the messiest to clean up, the heaviest, and can take up some unnecessary space in your bag. This option is best for car camping when you are starting a fire to cook up breakfast and making coffee for 4-5 people at once. Real Mountain Men don't need a yuppy paper coffee filter. 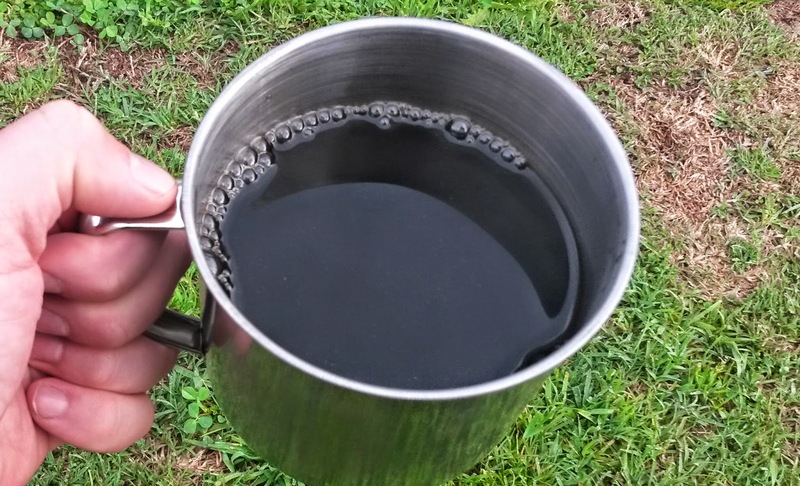 To make "cowboy coffee", fill your pot with water and brew the coffee right in the pot. From there, you have two options. The first option is to pour the finished coffee through your bandanna into your cup. The second is to drink straight from the pot, chew the grounds and grunt while string at the fire like a wildman. As with the percolator, coffee is brewed by boiling, so you may get burned flavor. The pot will need to be cleaned, but my mom used coffee grinds for compost, so I am sure there is nothing wrong with leaving the grounds in the soil. This option is best for 1-2 people (based on capacity of you backpacking pot). I first tried the GSI Collapsible Java Drip on a backpacking trip on Santa Cruz Island. I liked it so much, I brought it to work and used it instead of the coffee machine. 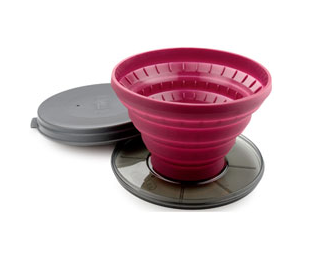 Just pull up the collapsible silicon and place a Melitta #2 (1 cup) or Melitta #4 filter with 2-4T of coffee. Wet all the grounds first, then slowly pour hot water over the grounds. The drip cone sits over a cup. The first cup is stronger and it gets weaker the more water that passes through the grounds, so for >1 cup, it is best to place over a pot or large container. This method is easiest to clean since you just pull out the filter and is good for up to 4 people. The weight is greater then cowboy & instant coffee, but it is only 4.5oz. What methods do you use? What is your favorite light weight coffee maker?